The motor yacht VICTORIAN ROSE is a perfect yacht for your Labor Day getaway! Victorian Rose, based in Wickford Cove (Newport, Rhode Island), is available for 4-person charters in New England this summer and fall. Have you made plans for Labor Day? Victorian Rose is available and would be a wonderful way to end the summer. 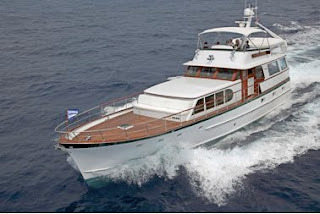 The charter motor yacht ANALISA is available for Christmas at her normal rates... NO Holiday Surcharge. 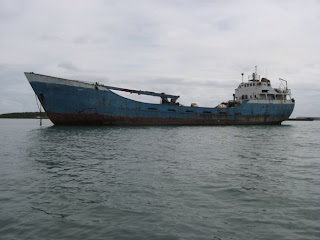 The Christmas charter must be for a minimum of 7 nights and finish by December 26, 2009. Analisa is a 60-foot Hatteras and accomodates up to 4 guests, up to 6 if family. Analisa is fully air conditioned and has 2 guests cabins, for family charters 2 children can sleep in the salon. 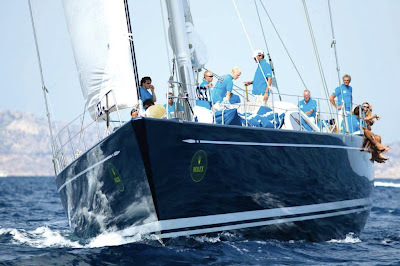 The 112-foot Swan, HIGHLAND BREEZE, is available for MAXI Yacht ROLEX CUP in Sardinia, 6-12 September 2009... The highlight of the Mediterranean yachting season! SASKIANNA is a light, airy, comfortable charter yacht with a layout well suited to couples and family cruising. 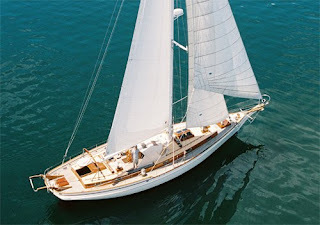 Her classic fine lines, traditional hull, beautiful brightwork, and teak decks turn heads wherever she goes. Below decks her white enamel paint and varnished teak trim echo the classic interiors of Nat Herreshoff. Her modern elegance truly sets her apart. 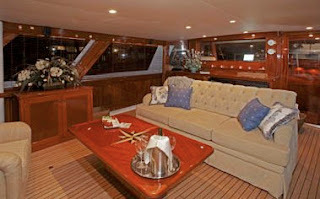 SASKIANNA can accommodate 4 guests in 2 cabins. The Master cabin has a queen size bed, a single bed, shower and toilet. The guest cabin has upper and lower singles beds. SASKIANNA is fully air conditioned throughout. Crew share companionway, heads and showers with guests. Get ready for a fabulous week! With the threat of TS ANA & Hurricane Bill coming our way, we decided to sail our own boat over to Curaçao but then ANA was forecast to pass to the south of us and thus getting in our way, and as BILL was to miss the islands to the Northeast, we stayed put in St. Martin. ANA became disorganized and then spread out more like a tropical wave. We heard from Gus & Marcella (catamaran MAROLANGA). They went to their hurricane hole in Vieques (Spanish Virgin Islands) and had lots of heavy rain & lightning. Their poor cat Sasha hid under a shelf and tried to make himself very small. They stayed there to wait out Hurricane Bill which fortunately gave our islands a wide berth. Marcella wrote today to say that they've "only had some little gusts and some rain. Not too bad…Now we getting a little bit rain from the tail of Bill. Outside are still waves 7-11 feet, so we waiting until tomorrow with sailing to Puerto Rico. Wind we have practically zero." They are going to go into the boatyard for a little bit for new bottom paint and this and that. 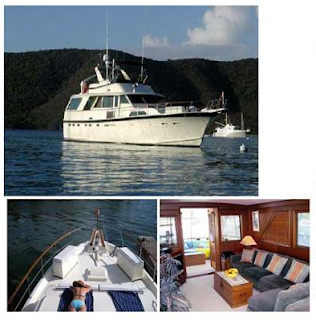 Marolanga is one of the few yachts chartering in the Virgin Islands through the summer season. 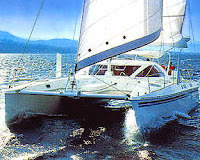 The trimaran PROMENADE went to their hurricane hole in Virgin Gorda, BVIs. Here's a photo of Bazza & Simeon tying lines up to the mangroves. Kerry is very happy to be back at their dock now that the storms have safely passed by. 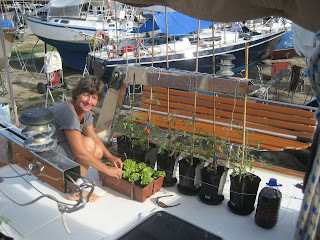 Charter Yacht BLITHE SPIRIT is down in Trinidad where Dominique & Michel are growing tomatoes while in the boatyard! Dominique didn't have to tether down her plants as Trinidad is theoretically out of the hurricane zone and Bill was nowhere close. STORM PETREL is chartering in New England this summer. Laura is Illinois doing a few house projects and nursing, while Phil is aboard Storm Petrel based in Falmouth, Buzzards Bay. They had a great repositioning trip, taking only 10 days to get there from St. Thomas. Phil's advice for us was: "To come north, just set your autopilot to 355, and enjoy. The spring trip is usually easy, no winds over 30 kts, seas calm... Fall is much more of an adventure!!!!" So, if you want an affordable, fun charter, aboard a yacht with LOTS of local knowledge of the New England cruising area, look no further than Storm Petrel. Short charters, weekend & daysails, too. Contact Paradise Connections and we'll set you up! A couple of weeks ago, Eric from ALOHA MALOLO wrote to say that they were "going to the Statue of Liberty today if we can get this RV through the traffic. I miss the ocean and Saltydog but we are visiting many past guests who have invited us to stop by on our trip." Charter yacht HANALEI BAY is on the hard in Trinidad. We received a call recently from Diane. They miss being on the water but they have a beautiful view of it from their patio in Vancouver BC. They had front row seats for the annual fireworks festival, The Celebration of Light, from their pieds-à-terre. Kim & Rich from the charter yacht QWEST wrote to us from the boatyard in in Fajardo, Puerto Rico where they were working on the boat and getting it ready to leave while they go to the States for a couple of months. Kim wrote "One of the high points of our summer is the Bean Blossom Blues Fest that we going to in Brown County, Indiana, next month. We'll be spending lots of time playing our ukes and jamming with friends. We don't have any photos (yet), but here's a link to a video of a jam from last year's Bean." 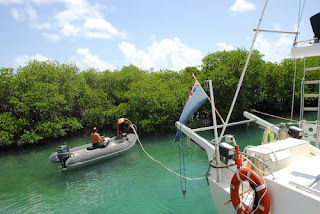 So, back now to Bob & Sheila at Paradise Connections... Due to the recent storms our plans have changed a little, but we intend to pick up our mail soon in St. Thomas (thanks Reefco!) and then sail towards Curaçao. We did Hurricane OMAR last year and we don't want to do that again. Quite a scary night... Especially when you have this boat dragging down on you during the stormy night of a category 3 hurricane!